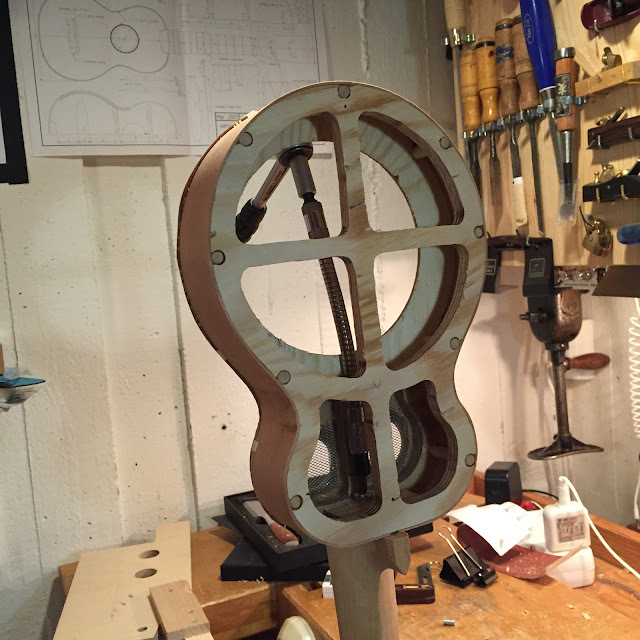 I have posted before about how I fit the bolt on necks on my ukes. 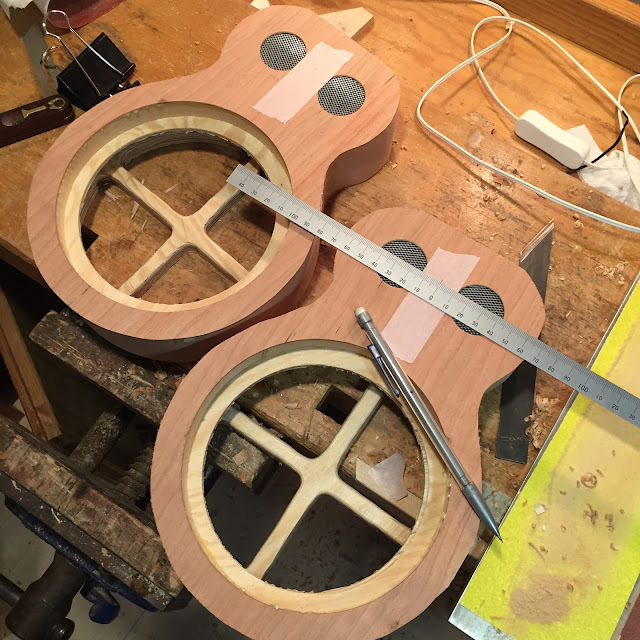 But I haven't posted about fitting these necks to these ukes, so here goes. I will give away all my tricks and secrets, and in the process I'll probably show some terrible mistake I'm not even aware is inherent in my process. But hey, this isn't an instructable, it's my diary. First I hollow out the face of the heel a bit so it'll be possible to get it nice and tight against the body. 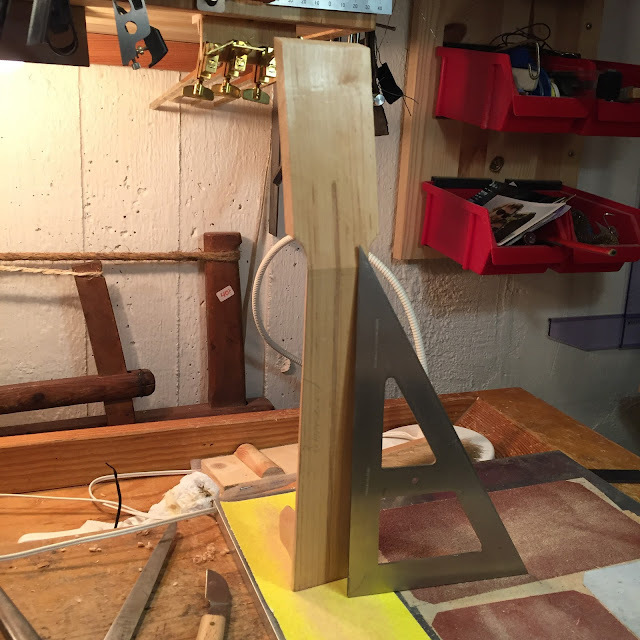 The recess is about a mm but will be reduced during sanding. On all my models the bodies are quite flat at the neck joint. 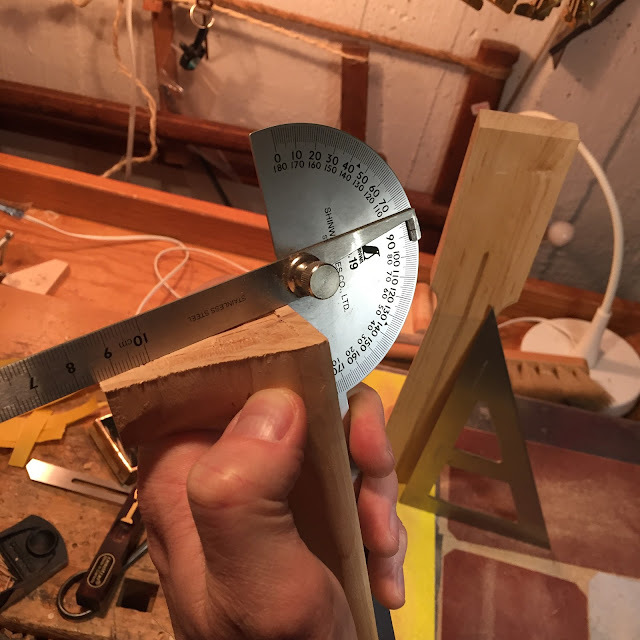 And on the resos I make sure it's flat and 90 degrees to the top since the neck angle is crucial because of the metal parts. 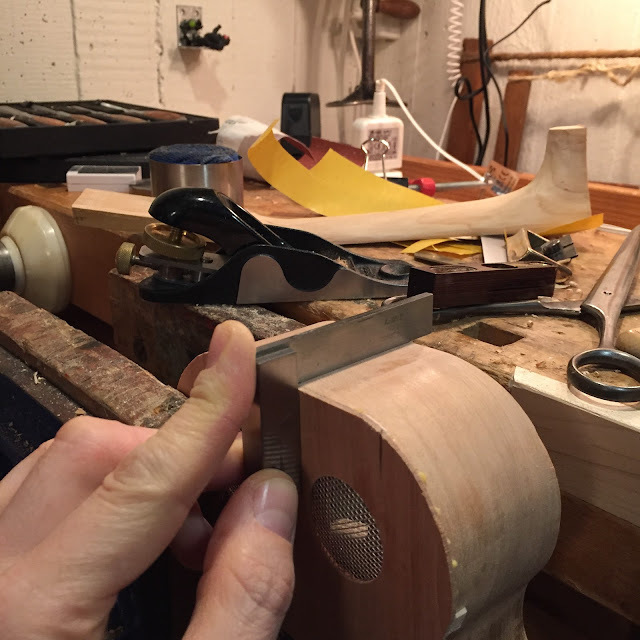 I went at it with my Veritas apron plane, a very nice block plane for smaller tasks. I check the angles with squares and what's it called, a protactor square. I shoot for an angle of 1.5 degrees, a number I have reached through trial and near-errors. 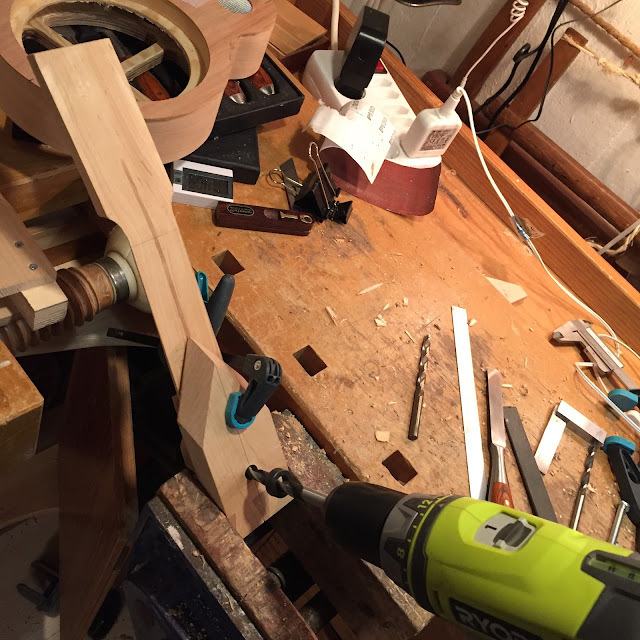 I wrote before about how great it is to work with one piece tops, and even one piece rims. No pesky centre lines to worry about. But checking the alignment of the neck, well there's a step where a centre line does come in handy. So a temporary line is found and drawn with a centre finding rule, a favourite measuring tool. 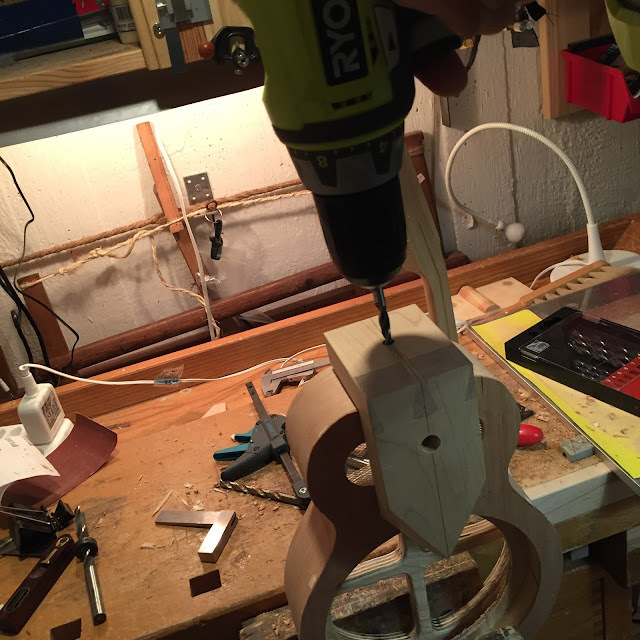 And now the scary part - drilling for the screw and the barrel nut. 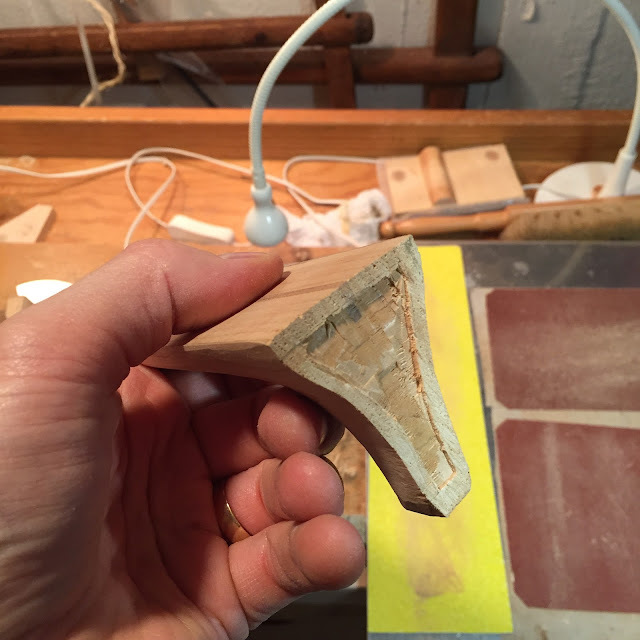 The jig should make it easy to succeed and nigh impossible to fail, but after carving the heel to a more delicate shape than usual I was afraid of simply bursting through the wood. 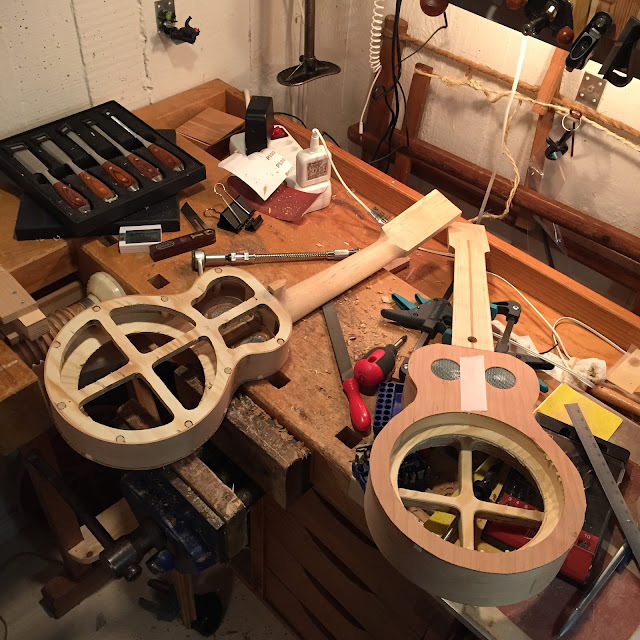 Dry fitting and final fitting turned out be the same process tonight, on both ukes even. I use that flexible wee shaft that's been kicking around since I was a kid, I've never had use for it before I started making resos. One thing I did before this final fitting was I gave the heel a quick rub with some sandpaper. These are not zero sanding ukes but this was the first sanding of the necks. And I regretted it at once - I hate the dust it makes. Flies around for ages and gets in my nose. And here they are, glued, screwed, scraped and laid to rest. I could accept someone doing that to me, bar the scraping. * Later, however, the neck should indeed rock like a severly rocking thing. Along with the rest of the uke and its owner.